MobileViews Blog :: AT&T says cell sites greatly improved in my area (twice). Oh, really? AT&T says cell sites greatly improved in my area (twice). Oh, really? 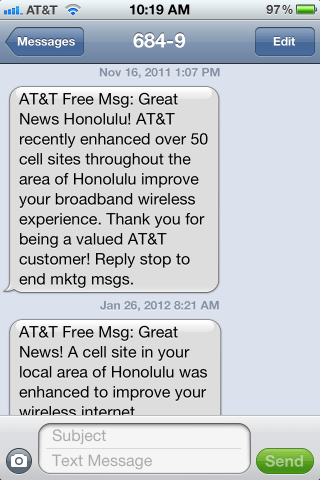 On Nov. 26, 2011, AT&T Wireless sent me a text message stating that over 50 cell sites in my area had been enhanced. Did I see better coverage or data speed? Actually, since then it appears that a section of the city of about 2 miles by 0.5 miles does not have any 3G data capacity (despite phones reporting it has a 3G signal) and often no voice coverage. In other areas, voice coverage has deteriorated to the point where voice conversations are difficult to conduct for more than a few seconds at a time. Yesterday, Jan. 25, 2012, I received another text message from AT&T Wireless stating that a call site in my “local area” (whatever that means) was enhanced specifically for wireless Internet access. Oh really? The Speedtest.net app reported a ping time of 432ms (very slow), 0.16 Mbps download (that’s 160Kbps) and 0.06 Mbps upload (that 60 Kbps or nearly analog modem speed). This is actually far worse than it was before the enhancement. To say the least, I am not impressed by AT&T’s “enhancements” to their cell towers. Posted by todd on Friday, January 27th, 2012, at 6:00 am, and filed under Mobile Phones. « Will iBooks textbooks need ads to support expensive multimedia book development?